Two experts—a nutritionist and a chef—evaluate the staple for health and deliciousness. the greenmarket	$4-$7/dozen stone arch farms Stone Arch’s pastured chickens spend most of their time outdoors eating protein-heavy grasses, seeds, and bugs, in addition to the usual grain mix. “When chickens eat the food found where they’re living, it changes the nutrition and flavor of the yolk for the better,” said Morrison. Sure enough, the egg whites retain their shape when cracked, and the yolks are strong—perfect for poaching. Available Fridays and Saturdays. $6/dozen flying pigs farm Our Greenmarket winner. These pastured eggs carry all the nutritional benefits of the Stone Arch eggs, and they had the deepest, creamiest flavor of all those sampled. “They’re so rich that using them for scrambled eggs could be kind of overwhelming,” said Weld. “But if you’re doing something special, like scrambled eggs for dinner or cooking an egg in a salad, they’d be amazing.” Available Fridays and Saturdays. $10/dozen violet hill farm Though shell color has zero effect on taste or nutrition, these eggs earn points for sheer attractiveness. Violet Hill crossbreeds its pastured chickens to create eggs with russet, olive-green, and even speckled shells. They taste as good as they look: “This has the best mouthfeel of all the eggs,” said Weld. “It doesn’t have a super-deep flavor, but I’d definitely call it a standout.” Available Saturdays. $3.50-$4.25/dozen knoll krest farm Knoll Krest feeds its chickens a grain mix with occasional carrot and spinach pulp left over from juicing, all of which boosts vitamin content. The yolks hold their dome shape well when cracked—another sign of a healthful egg. Weld was impressed: “I feel like I could hit these yolks with the spatula and they wouldn’t break.” Plus they’re well priced for everyday frying. Available Wednesdays and Saturdays. Our resident porkologist, Grub Street’s Josh Ozersky, anoints the best breakfast meats on the market. $6.99 a pound at Food Emporium, 10 Union Sq., nr. 15th St.; 212-353-3840. WHY IT’S GREAT: Of the standard brands, Oscar Mayer strikes the best balance of salty and sweet, and the ratio of fat to lean meat is exactly what most people like. The thick slices allow for more pork flavor than most tissue-thin supermarket bacons. ALMOST AS GOOD: North Country Smokehouses’s applewood bacon, which is a little smokier ($8.49 a pound at Todaro Bros., 555 Second Ave., nr. 31st St.; 212-532-0633). $8.99 for a twelve-ounce package at Murray’s Cheese, 254 Bleecker St., nr. Cornelia St. 212-243-3289. WHY IT’S GREAT: A subtler, porkier, all-natural bacon produced by actual dry curing, not the industrial-injection method used in supermarket bacons. You give up a little acridity, but the density and deep pork flavor make up for it. ALMOST AS GOOD: The nicely smoky Nueske’s bacon ($8.29 at Fairway Market, 2127 Broadway, at 74th St.; 212-595-1888). $7.95 an order (between eight and ten pieces) at Rub BBQ, 208 W. 23rd St., nr. Seventh Ave.; 212-524-4300. WHY IT’S GREAT: Tennessee bacon guru Allan Benton advised on the cure, done in-house to Berkshire pork bellies before they go in for a cold smoke, a hot smoke in a hickory wood-fueled barbecue pit, and finally a browning bath in boiling lard. Reserve ahead, then fry it yourself at home. ALMOST AS GOOD: The Grateful Palate’s online Bacon of the Month Club includes most of the country’s great slabs, like a hickory-smoked brown-sugar bacon from Gatton Farms (one-year membership from $295; gratefulpalate.com). Don’t use a frying pan. Don’t even use a well-seasoned cast-iron skillet. No, bacon strips are long, and the center of a pan (where the heat is most intense) is small, so inevitably the middle crisps up while the ends are left limp. 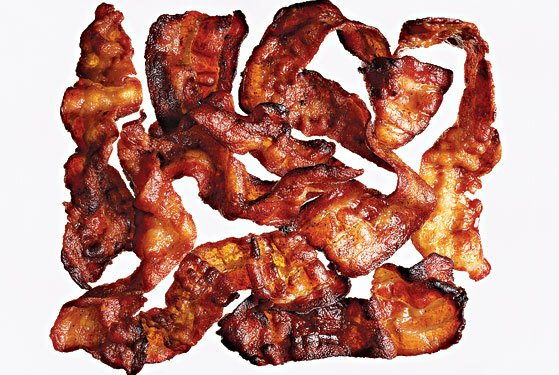 For an even, slow cook, lay the bacon out in a sheet pan in a 375-degree oven. Cook for about fifteen to twenty minutes. Remove when it’s brown and resistant to the tooth, but not crispy to the point of brittleness.